Genesis is up for sale! Our contingent contract on Genesis did not go through, so she is still For Sale! Call me if you have any questions about this rare classic beauty! See my previous post for all the details! With mixed feelings, we have made the decision to part with Genesis, and as of today she is officially for sale. She is priced at $59,900, reflecting our desire for a quick sale for a solid example of what many call Willard's finest looking boat. Only six of these Aft-Pilothouse models were made by Willard. Genesis and Trident (formerly owed by Forrest Myers) are the only two on the East Coast. (I've been unable to confirm Trident's status after the hurricane went through Key West). Isuzu 140 hp, six cylinder diesel – runs perfect, burns approx. 1–1.5 gph at cruise. Mast and beam are in good shape, minus some hardware. These were removed and are stored indoors. The original curved deck hatch was removed for repairs and is available. A temporary hatch cover is in place. Bottom was sanded, blisters repaired with epoxy, then 6 coats of epoxy barrier, primer and 2 coats of bottom paint applied. There are a couple of places with soft wood under the galley windows that need attention. The Vosper hydraulic stabilizers are not functioning. The previous owner stated that the engine driven pump was not working (no pressure) and he disconnected it. The old radar display did not work and was removed. The radar dome is still in place, but it's condition is unknown. The old auto-pilot controls did not work and have been removed. The old pump is still in place, but inoperable. The engine hours are unknown. There is a working hour meter, but is is unknown when it was installed. The engine runs great, though, with no smoke and no oil usage. We have logged 2000+ miles without any engine/transmission issues whatsoever. She needs paint and minor cosmetic work, of course. This was our last day of the trip, and with not locks to contend with, it was a no-stress, easy 50 miles to Demopolis. It was probably our best wild-life watching day of the trip, with deer, hogs, eagles, osprey, and a raccoon that played peek-a-boo with the camera and wouldn't let me get a picture of him. 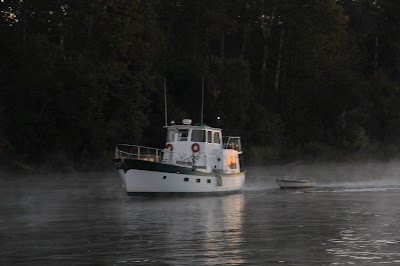 We pulled anchor this morning and stopped at the main river channel to let a towboat and his load get by. There was a thick fog to our south, but the tow captain said it was pretty clear about a mile below us so we idled along until we cleared the fog. If you look really closely through the fog, you can see the tow pushing barges coming up the river. It was a beautiful day to be out on the river! You never know what you'll see around the next bend. We turned the boat around and watched this eagle for several minutes before he got tired of us and flew away. He didn't want to give us a frontal shot, but did let us snap a few side profiles. We arrived at Kingfisher's Bay marina early afternoon, and Anna Marie was there to catch our lines and welcome us home. It was a great trip and somewhere along the Tennessee-Tom between Demopolis and Columbus I left all my stress and worries. Therein lies the greatest part of river cruising! Even with the threat of storms last night we slept good. Awakened to several fishermen putting boats in at the boat ramp near where we anchored. Had a little fog but not enough to hamper our leaving. It was a good day for wildlife. We saw beautiful deer, more wild hogs and got great photos of eagles. A lot of yelling takes place when one of us sees something to "get the camera". Inevitably the one with the camera doesn't see the animal. You just have to laugh. It is hard to explain the rush you feel when you see God's creation out in the wild doing what He made them to do. We couldn't figure our what these two young bucks were eating in the sand, but they obviously liked it! Wild hogs bring us mixed emotions. We love to see them, but then remember that they are invasive, destructive, and very costly to our farmers. It seemed the trip was over very quickly. Just as we were about to get to Kingfisher marina it began to rain just a bit. That was the first rain we had while the boat was moving during this entire trip. We got ready to leave this morning and called the Stennis lock to ask about a lock-down. The lock master said he was about to bring up a tow and would be ready for us in about 20 minutes. Perfect! We untied and got Genesis turned around and headed past "Tessera", who's owner was on the dock waving us goodbye. Tessera then followed us out to the lock wall, where she turned north toward Kentucky. You meet so many people as you travel on the river - its always fun to hear their stories, and EVERYBODY has a story! "Tessera" is the sailboat in the center of the picture. Last night's storm clouds in the background never reached us. Sunrise this morning as left the marina in Columbus. We are waiting at Stennis lock as a tow and his barges (left) exit headed north. The workboat tow (the "Tenn-Tom") on the right is anchored to the side of the entrance. We made great time going downstream today, and actually made it through all three locks, leaving only 50 miles between us and our homeport of Demopolis. The weather was just what you want on a river trip - just enough cloud cover to keep the heat down, but still a beautiful day. A first for us! This juvenile eagle is in the middle of getting his "adult" colors. His head is almost completely white, but his tail is still the mottled color of young eagles. His body will be completely black when fully mature. The same eagle, showing his underside is not the mature black yet. We saw lots of people getting a head start on Memorial Day weekend - fishing, skiing, swimming, and just enjoying the river. We got through our last lock, the Howell Heflin, about 5:00 and anchored in the oxbow just south of the lock. The female lock master told us that she did not expect a heavy current from the dam, and that we should have a peaceful night there. We anchored in a gusty wind that pulled our boat in the opposite direction of the current, but after about 30 minutes it calmed down and we swung 180 degrees, where the mild current kept us stationary all night. The storms that radar showed all around us dissipated and all we got was a gentle drizzle - we didn't even have to close the portholes! We slept good, serenaded all night by the frogs and birds (and an occasional "grunt" that sounded familiarly like an alligator). We got off to an early start today. I had Daisy out walking at 5:15 this morning. I was able to make me some coffee before Tom disconnected the power from the boat. We were out of the marina and almost to the lock by 6:00am. We waited just a few minutes and then we were in and out and on our way. The breeze kept us nice and cool today. I saw lots of turtles and birds. Seeing turtles always makes us miss the grandkids - they LOVE to see turtles sunbathing along the river. You never know what you're gonna see on the river! I caught sight of a young eagle and this time Tom got some good photos. I fixed some chicken and rice for lunch. With the breeze blowing through cooking did not heat up the pilot house. We were making good time. We ended up getting through all three locks before we stopped for the evening. We have not seen any rain on this entire trip but now I am listening to thunder rumbling and hear spinkles of rain on the boat. It may storm but the anchor is secure. Storms danced all around us for the entire 5 days of this trip, but we never got more than a light drizzle. We decided to spend the day in Columbus today. We woke up early. I got a decent cup of coffee from the nice man here at the marina. The sky was overcast and the air felt comfortable. We watched a beautiful yellow bird flit and trill around the boat. Does anybody know what kind of bird this is? He was really pretty and loud. Sorry the picture is so blurry, but he was fast, too. It was a good start to the day. We walked Daisy over to the recreational area near the lock and watched a fisherman for a bit. We cleaned up and took the courtesy car ( it has new tires 😉 see Septembers post) into town. We had another delicious meal at Harveys. I had honey salmon with asparagus and rice. We made a walmart run and picked up a few things for the trip back tomorrow. We rested the afternoon. Then walked back over to the lock area. I actually got my 10,000 steps in today! Last night I posted that we would only have a short ride to Columbus Marina today. That was my thought when we took our time this morning and didn’t pull anchor until 9:30. When we got to the lock, I realized that I had looked at my charts wrong. We were at the Tom Beville lock, and the Columbus (Stennis) lock was another 30 miles away! At the Beville Lock, we arrived as the "Vincent W. Sapp" was entering the chamber to lock up. As soon as he was through and the chamber was emptied, the motor vessel "Let It Ride" and our Genesis locked through. After some quick caculations, it appeared that we could still make it to Columbus before dark, IF we didn’t get delayed at the Stennis lock. The wild card was the tows and barges. We had been just behind the tow “Vincent W. Sapp” all morning, and had to wait about an hour at the Beville lock for him to be locked upstream ahead of us. We needed to up our speed and get far enough ahead of him, that the Stennis lockmaster would take us up ahead of him. I set the throttle at 2,000 rpm, which yielded about 7.5 mph. The Vincent W. Sapp was doing just over 5 mph, and we passed him when he stopped to let another tow get by in a tight bend in the river. When we were about 2 miles from Stennis, I called them by radio and requested a lock upstream. The lockmaster said he had a northbound tow in the chamber, and would get us as soon as that one exited and he could empty the chamber. As we rounded the bend and the lock gates were in sight, I saw two familiar boats - the motor vessel “Let It Ride” that we locked through at Beville with, and the sailboat “Tessera” that left Demopolis just behind us Tuesday morning. Tessera had passed us this morning while we were still anchored. Both other boats had been waiting awhile at the lock, but after a few minutes the lower gates opened and we were given the OK to enter the chamber at about 5:40. As we were entering we heard the Vincent W. Sapp telling the lockmaster that he was approaching the lock. Whew! If they had taked him first, we would have been waiting another hour or more! Genesis, Let It Ride, and Tessera were all planning to dock overnight at Columbus Marina. They normally close at 6:00 pm, but the manager said he would stay to guide us in and help us tie up. The channel leading to the marina is narrow and twisted, so he talked us through our arrival by radio. He did a good job at guiding us, and two of the three boat captains did a good job of following directions. The other captain (yes, me) missed a critical marker and grounded his boat. After about 20 minutes of futile attempts to unstick Genesis from her greasy mud bed, the marina manager went to get another boat to try and pull me out. As he left, I decided to give it one more try. SLOWLY I felt Genesis move a couple of inches. Little by little she slid backward through the mud to deeper water. I manouvered to the correct side of the marker I had missed earlier, and made it to the dock - minus a ton of pride, but otherwise unharmed. Out of the mud and safely docked at Columbus. He was just soooo cute!! I woke early this morning and made some instant coffee. I will not fall for that “ convienience “ trap again. That stuff is awful! Tom slept in. I did my quiet time up top and watched the fish jump. I was hoping to see my groundhog friend again but he didn’t pop up. We did not get out on the river till about 9:30. There were more tows about today and that slowed us down a bit. It was a nice day on the water. I saw several does grazing on the bank and there were lots of fishermen and pontoons. We arrived late at the marina and Daisy and I both were ready to get off the boat and walk a little.